Rebelles awoke to a beautiful fall morning in Johnson Valley with perfect temperatures and breakfast prepared by Drew Deckman and his talented staff. Day 6 of the Rebelle Rally presented by Hoehn Adventures started with a Precision Enduro, which is unlike a Rebelle Enduro Challenge (REC) in that rather than being designed for a specific time or speed, a Precision Enduro is designed to run along a specific cap heading. Three different road books were designed to keep teams from following one another, but with 4×4 class leaders Team Blondetourage #125 (Kaleigh Hotchkiss/Teralin Petereit) first off the line, there was plenty of follow-the-leader going on. Leaving Johnson Valley, the plan was to go through the stunning Joshua Tree National Park. Course Director Jimmy Lewis and his staff spend all year designing the perfect course for the Rebelle Rally, complete with challenging CPs and detailed Rally Navigator-generated road books. Sometimes Mother Nature has a different idea though. 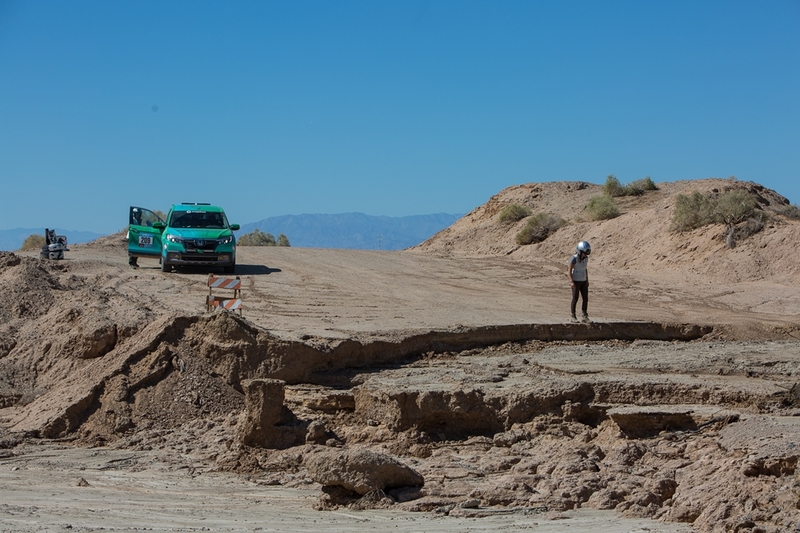 The roads in Joshua Tree National Park were washed out by recent rains. The staff reacted by routing the course around the Salton Sea past Mecca en route to the artist compound known as Slab City. 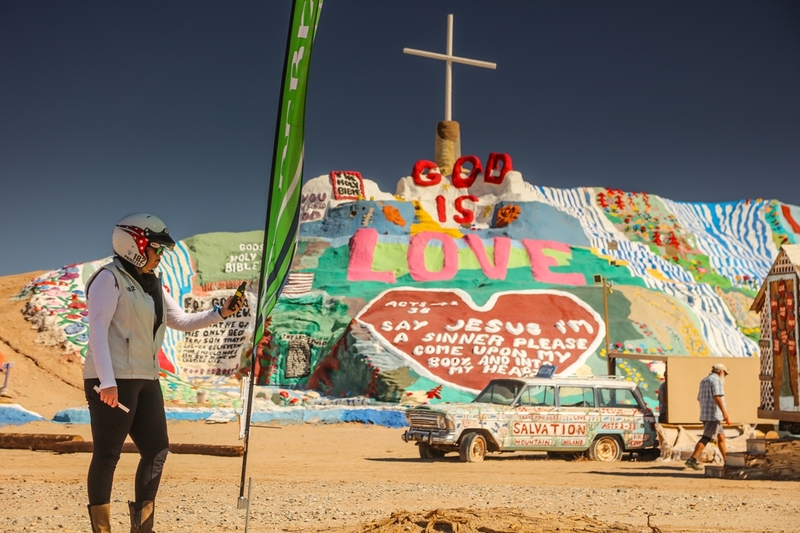 After Slab City teams traveled through Mammoth Wash, which required slow, deliberate tire placement to safely drive to Imperial Sand Dunes (Glamis). Reaching green CPs before their closing times was an issue for all teams on Day 6, with traffic, fueling, and road conditions eating up valuable time. 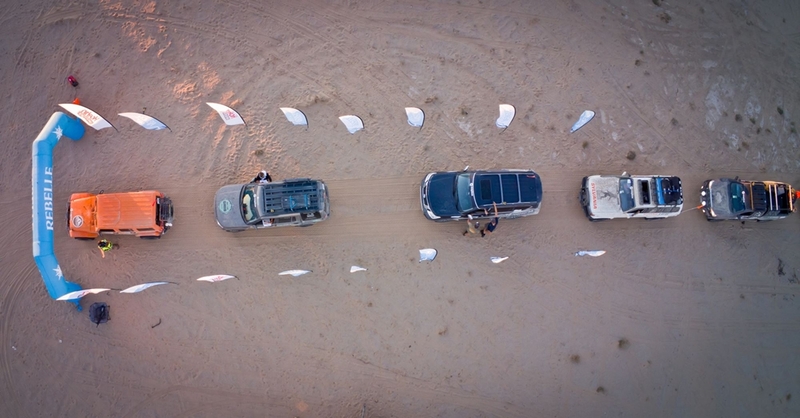 The format of the Rebelle Rally requires teams to manage their time efficiently, as there are set windows of time for each checkpoint. Miss the time cutoff for a green CP and your day is over; literally. Posting the highest score of the day in the 4×4 class was Team Sassquatch Rebelles #184 (Amy Hopkins/ Kendra Miller) with 154 points. Following closely behind them by two points was Team#140 (Emme Hall/Rebecca Donaghe), and then Team Hoehn Adventures #109. Despite the change up in the daily winners, Team Blondetourage #125 (Teralin Petereit/Kaleigh Hotchkiss) remains in first in the 4×4 class above Team #140 by two points. Coming in third is Team #109, with 11 points to catch up. In the Crossover Class, Team Hoehn Porsche #202 (Lisa Wolford/Sandy Conner) won Day 6 to extend their lead in the overall standings. Currently 50 points separate Team Hoehn Porsche and second place Team Naviguessers #210 (Emily Winslow/Alicia Farar). The final stage of the 2018 Rebelle Rally will push the competitors deeper into the dunes of Glamis in search for elusive CPs. Past editions of the rally have taught us that nothing is certain when dunes are part of the equation. Teams have gotten stuck, broke, and ran out of fuel at Glamis, plunging their position in the standings. Other teams have taken all the skills that they have learned over the week and applied them on course to upset significantly more experienced rivals. Anything can happen at the Rebelle Rally! Daily Tech Tip – What Is The Team Spirit Award? It is not always about your score, but how you compete. The Rebelle Rally Team Spirit Award is designed to promote and encourage a positive spirit in the midst of focused competition. It is searching for solutions, providing encouragement, and treating others with respect and enthusiasm – which ultimately results in fostering a spirited competitive climate. The Team Spirit Award winners, as voted on by staff and competitors, receive a $2,500 donation in their name to the charity of their choice, generously provided by Off-Road Like A Girl this year. Delicious, freeze dried meals are not an oxymoron thanks to official supplier Mountain House. Rebelles, media, and staff’s lunchtime fuel is made up of Mountain House chicken fajitas, mac and cheese, and the occasional breakfast scramble. Not a bad way to break up the day.